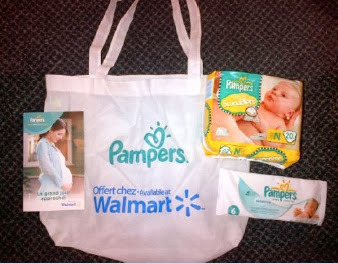 Back in August, Walmart Canada and P&G began sponsoring a series of prenatal programs in hospitals and community centres countrywide by providing soon-to-be parents with special gift bags with Pampers product. The reusable Walmart gift bags include a package of Pampers Swaddlers, the number one choice of Canadian parents for newborns, a sample of Pampers wipes and an educational pamphlet. This program will reach 55,000 new moms from coast to coast, providing helpful tips on everything from how to secure a car seat to birth plans. When I was expecting, Chris and I went to a prenatal class at the hospital where Hannah was born. It was really great for us to be around other first-time parents since we are the first in our group of friends to have a child. It was also nice getting a sneak peak at where Hannah would spend her first days after she was born. About two weeks before her due date, I packed my hospital bag...choosing her first pjs and outfits was difficult. We were told we were having a girl, but just in case I packed a few "gender neutral" outfits too. And of course, I had Pampers Swaddlers in my bag! I had a birth plan - but it definitely wasn't followed. I was induced, had my water broken and eventually (after pushing when my epidural had fallen out) I was taken for an emergency c-section as a "failure to progress". Being on the "younger" side of all of our prenatal classmates, I thought for sure I'd have a "normal" labour. That wasn't the case. Hannah was worth the pain of every sailor swear I yelled, but I am somewhat grateful to know if I ever give her a sibling they will be a planned c-section. If I could give one piece of advice to "pre-Mom" me it would be this: Don't let anyone tell you what your child needs. You will be given a lot of unsolicited advice from people (often strangers) who think they know best. Sometimes this advice is given from a good place, at other times it is given from people who seem to have their own agenda. When you're new to anything, you second guess yourself. When you become in charge of another life, a teeny, tiny human, you can get confused about what's right. The only opinions who mattered to me a few months in were Hannah's doctors, Chris and sometimes my Mom - and of course, Hannah herself (she schooled me quite quickly in what her cries meant). Becoming a Mom is probably the scariest thing that has ever happened to me - but it is easily the best. Even writing this post it's hard to think back to a time before Hannah. I was most excited about having someone look like me. It sounds weird, but I am adopted, so I have never looked like any of my relatives. All the FIRSTS! Like first words, walks ect..
For sure! I'm still waiting on some firsts...the other day we had our first conversation in full sentences, was awesome! I was just most excited to have and hold my baby. I was most excited about seeing my new baby and how she would look like her father or me or someone else in the family! I was so excited to see what my babies looked like! Nothing in particular.. just being a mum in general, getting to hold him and get to know him. To finally be a mom. I had dreamed of it for so long! I was most excited about seeing my baby for the first time and holdinghim. The most exciting thing for me was knowing that this baby grew in me. Just an amazing feeling. To see what my babies look like!!!!!! I was just plain excited to be a mom! Best job ever! I was most excited about watching our baby grow and all the firsts. I'm not a mother but I'm excited to watch my brand new God daughter grow. Seeing what my baby would be like and discovering their personality! Couldn't wait to see what she looked like and now with #2 due in two weeks same anticipation!! Raising our daughter through the fun and tough times alike. I was most excited just to meet my son. Although when I was in labour, I think I was most excited about just getting him out. Meeting them for the first time, and buying all the cute little outfits. Was excited for the cuddles and trips to the park! I was excited to see how much of "me" she had in her . I was most excited to be able to cuddle with my baby girl! Excited about having a mini-me! Most excited about what the baby looks like! finding out the gender and seeing my baby for the first time. That was most exciting! I was most excited about seeing who he/she looked like! I was most excited about seeing my baby smile for the first time. I was most excited to meet my mini mes face to face! I'm excited about who the baby looks like more! I was excited to hold MY baby in MY arms, an individual who came from me, every baby is a miracle and mine was one too. I was just excited about it all....but mostly the experience of love that I saw my friends have for their children! After a few years of trying, the birth was amazing. I fell in love in an instant! I was excited about just being a mommy,having a lifetime of cuddles and kisses!! I would be most excited about holding my baby! Finally meeting my baby after waiting 10 months! Just having my little baby to hold excited me! Aside from the obvious. The showers, decorating and receiving the kind of gifts I had previously had so much fun with! The love one feels towards that child. The love I felt towards my child.